Yeah, I know, I know. It’s supposed to be Photo bomb Tuesday not Photo bomb Wednesday hence the title. Well, Monday was a bit packed as you’re about to see and yesterday was spent in the pool. It is summer after all not to mention by my brief summer vacation. Monday was one of those days that while loads of fun with the kids and something I hope they’ll remember, it was a bit tiring out for me. Our AC until was being replaced so we had about eight hours to kill and not much in the ol’ bank account to fund anything too expensive. WWTBGD (What Would the Big Guy Do?) became my mantra for that day so we hit the Coastal Empire for a little exploration and adventure. I explained to Roni and Jude about how Noble Jones had come over on the Queen Anne with Oglethorpe in 1733 and became the colony’s first doctor when the original doctor died on the voyage over. 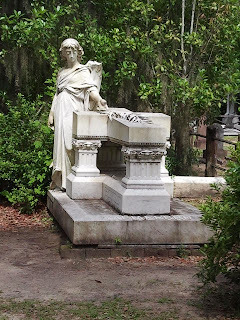 As a thank you, Oglethorpe gave 500 acres to Jones which became Wormsloe. 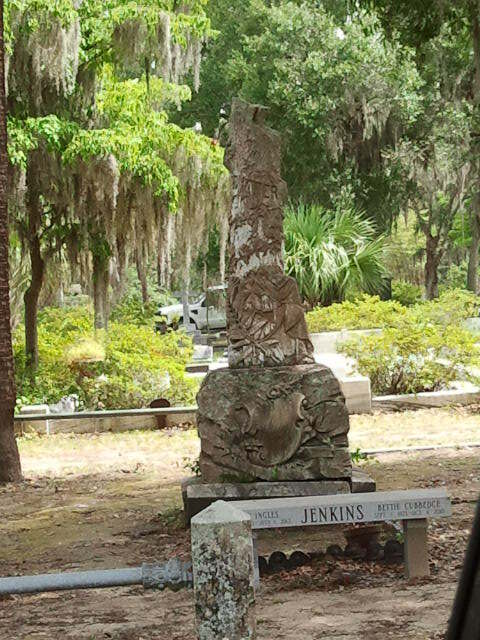 Jones had the foresight to know his land would go to his sons so he began planting live oaks along the entrance as a future wedding gift to his son. 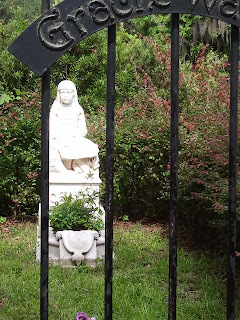 That wedding gift would lead to be one of the most photographed pictures in the Coastal Empire and has one of my favorite views of Savannah since I learned how to ride my bike and explore. Over Sunday dinner, the kids had asked about Bonaventure Cemetery and how it fits into Midnight in the Garden of Good & Evil so this seemed like a reasonable next stop and apparently a good choice, Roni and Jude were enthralled. I was also surprised about how many tourists were out there. 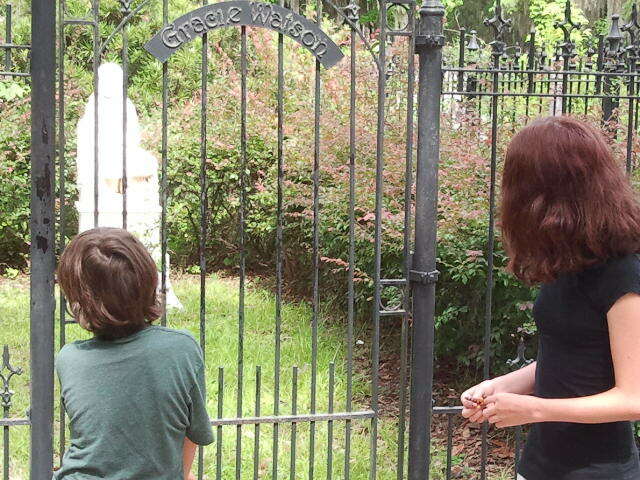 We stopped at the Gracie Watson plot and I told them all about how Gracie had died of pneumonia leaving her parents so upset they hired a sculptor to create a life size statue of their beloved daughter. 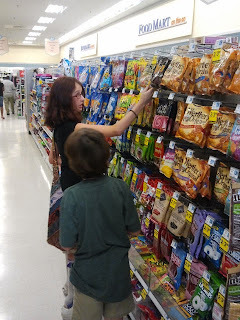 The kids were impressed at the details. Unfortunately, vandals back in the 80s broke her nose off (which has long since been repaired) so a fence is up now. I told the kids about walking up to the plot about when I was their age and spent forever looking at the detail on this sculpture. I get the reasons why there is fence now but I hated that the kids couldn’t see all the tiny details that still stick with me. I told them about how Gracie’s shoes have buttons and if you look real close, you can see how the sculptor carved stitching into the buttonholes. 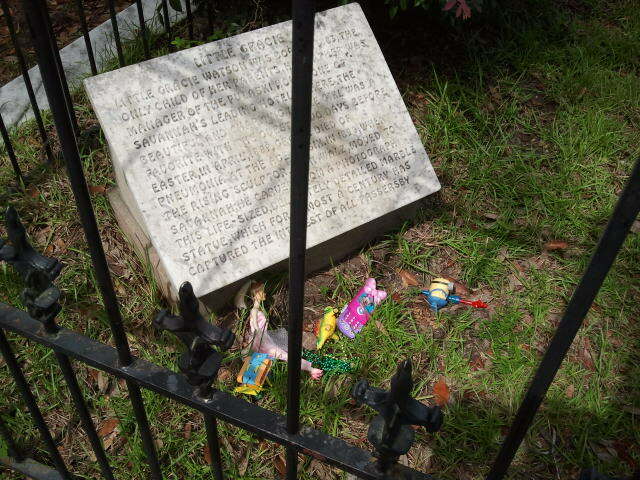 I had seen people leaving toys out here for other graves but never for Gracie. It seems fitting and we had wished we had brought some too. "Can you smell what the Ty is cooking?" We made a quick stop over at HISRadio which my cousin runs quite well to drop off a cooler they left at the Geeky Hut during our Fourth of July festivities. This is our Cousin Ty and future world renowned athlete. 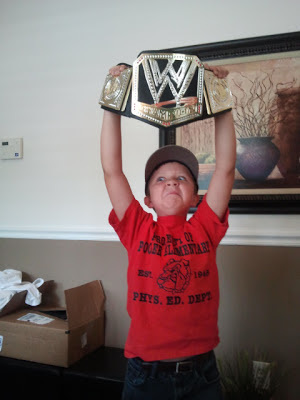 Here he is showing off his latest sports acquisition. 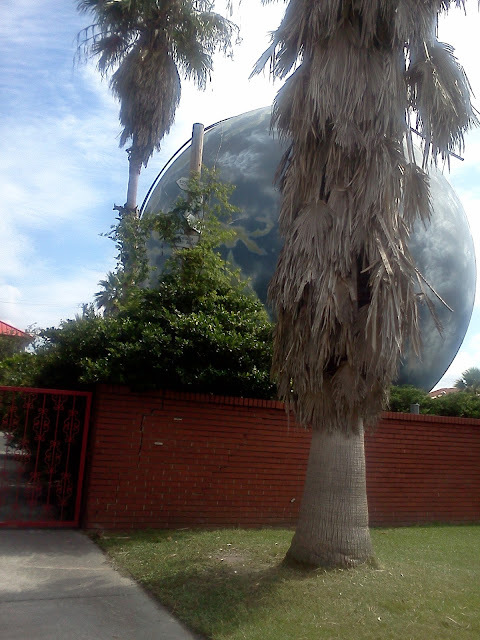 If you have drove into Savannah via DeRenne Ave then the giant globe should be a familiar sight. On our numerous drives up from Milledgeville as a child, the Globe was always a welcome sight. Combined with the smell of Union Bag and watching Mom spray her White Rain hairspray, I knew I was minutes from Grandma’s macaroni & cheese. The Globe was originally used back in the late 50s as a natural gas storage container then painted to resemble one of those globes you’d see in a classroom. Around 1998, SCAD repainted it to look like it was in space. Hurricane Floyd is also on there if you look carefully. If you’ve ever seen Forces of Nature which Sandra Bullock and Ben Affleck, the globe is featured as a sandwich stand. 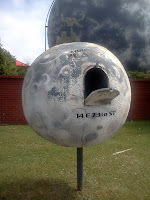 Most people don’t know there is a mailbox behind it which resembles the Moon. My dream is to run a tour company out of this place one day. With the tour winding down, we had movie plans to meet up Roni and Jude’s cousins to go see Despicable Me 2 over in Pooler. 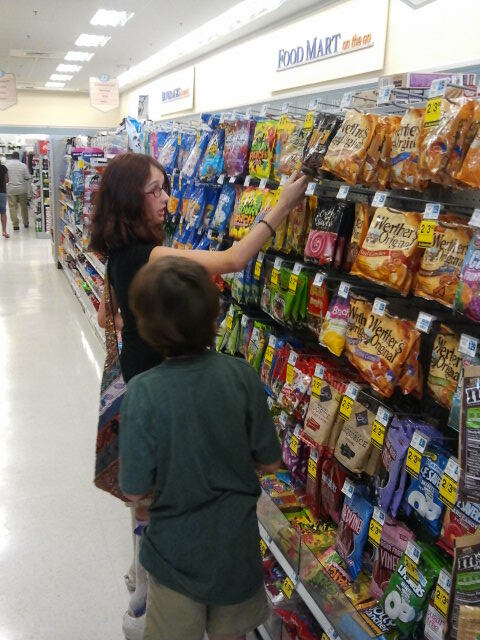 After a careful selection of Gummy Coke Bottles for Jude and Roni selecting Circus Peanuts, we were off to pick up Kim at her workplace. 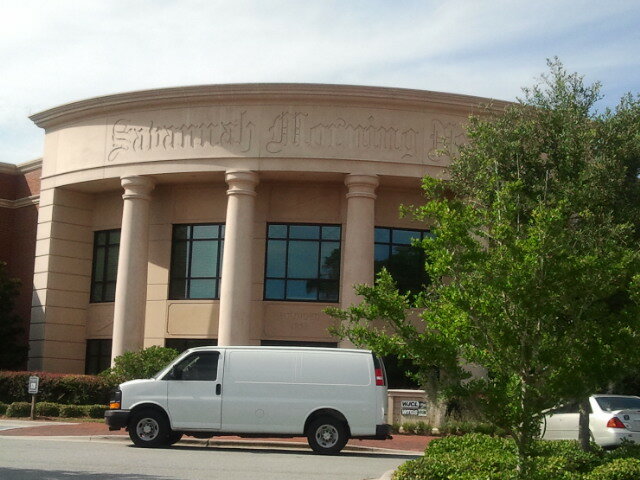 The new Savannah Morning News is pretty fancy but I do miss it being located downtown. I get why they moved and the new digs are impressive and up with the times. I just love seeing that older building and picturing hard boiled news men wearing ties and fedoras working on their stories. It’s kind of hard to picture that here. The Robby AC Tour 2013 wrapped up with the ladies heading back to the newly air conditioned Geeky Hut while the men struck out to ATA Karate. 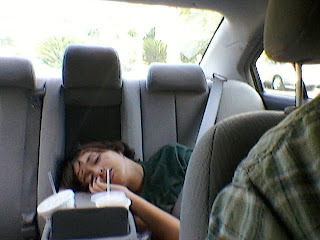 Here you can see the day taking its toll on Jude. Frankly, at this point, I knew exactly how the Little Man felt and fell asleep during his karate myself. Well, this wraps up the tour. Please gather your belongings and head to your nearest exit. We here at Broken Compass Tours recognize you have many tour choices to take here in Savannah and we appreciate you for choosing us. May the beer always be cold and your compass always point south.